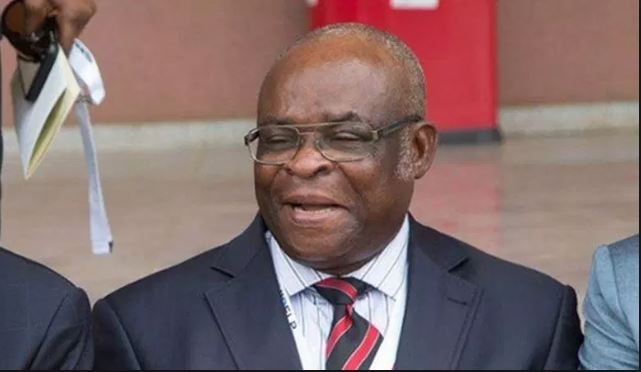 The suspended Chief Justice of Nigeria (CJN), Justice Walter Onnoghen, has alleged that the two asset declaration forms he submitted to the Code of Conduct Bureau (CCB) have been manipulated. Justice Onnoghen made the allegation on Monday in Abuja through his counsel, Adeboyega Awomolo (SAN), who cross-examined a prosecution witness at the resumed trial on the six counts of non-declaration of assets brought against him by the Federal Government. The allegation came when the first prosecution witness, a senior investigation officer with the CCB, James Akpala, sought to tender the two asset forms investigated by the bureau. But when the attention of the defence team was drawn to the two asset forms, Awomolo consults with Onnoghen for verification before tendering the forms. While giving his testimony, Akpala explains how the CCB referred a petition from the Centre for Anti-Corruption Initiative and signed by one Denis Aganya to him and two others on January 10, 2019. In the process, he says his team met with Justice Onnoghen, obtained a statement from him, and applied for his account details with a commercial bank. The witness adds that the investigation was concluded on January 11, when the team’s report was prepared. Under cross-examination by the defence counsel, the witness says he did not know whether the CCB had a central registry and register where all returned asset declaration forms were kept. Also, he informs the tribunal that investigation into the petition against Onnoghen was concluded within 24 hours by his team. When asked if he was aware that the charges against the justice, list of witnesses, and proof of evidence, were prepared, dated and signed by the prosecutor on January 10, 2019, prior to the conclusion of his investigation, the witness declines. However, he confirms the dates when he was confronted with the documents.